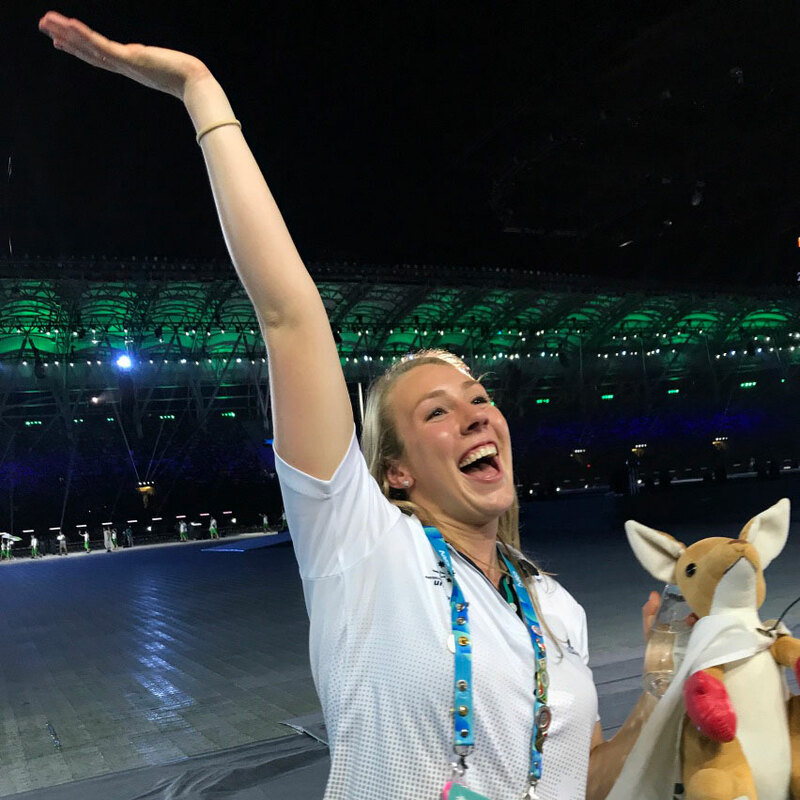 As an elite water polo player and third year Bachelor of Physiotherapy student at the University of Newcastle, Julia Barton knows the importance of balance, determination and resilience in the face of hardship. Julia’s sporting history is extensive to say the least. Swimming and surf lifesaving in her early years but it was at the age of 13 that she found her calling with water polo. Joining the Hunter Academy of Sport shortly after, Julia has played representative water polo at the junior and senior level in local, state, national and international competition for more than a decade. In that time, she’s won two gold medals at the 2015 Australian University Games and the 2015 World University Games in South Korea, received a scholarship to play water polo for the University of Hawaii, returned to Australia where she captained the University of Newcastle’s women’s water polo team at the 2018 University Nationals, battled injury and setbacks, and continued to work towards her Bachelor of Physiotherapy. If there’s one thing Julia knows better than most, it’s understanding what it takes to balance sport, study, life and personal wellbeing. And while working her way up the ranks of the National Water Polo League, she was also working towards a career after sport – focusing on her passion for physiotherapy. “In terms of life balance, I find that my sport gives me a break from university and university gives me a break from sport. I love my degree and I love water polo, so I don’t mind having a busy schedule. “I’m a huge believer in the benefits of exercise on overall wellbeing. The physical benefits of sport and exercise are obvious, however the mental gains are equally as important. “Sport teaches us discipline, how to work as a part of a team, how to set goals and work towards them. How to meet deadlines, how to respond to criticism and how to utilise feedback. “It gives us a safe space to experience failure and teaches us how to respond, it develops resilience, it challenges what we believe we are capable of and pushes us to extend ourselves,” Julia said. Being resilient is something Julia knows all too well. In the last 18 months she has faced two injury setbacks, personal loss and professional hardship – but through all this, her determination has never wavered. “’This is not the hardest thing I have ever been through. I will face harder things in life and survive,’ is a mantra that frequently goes through my head. “My injuries have challenged my sense of identity and made me think about who I am as Julia Barton, not just Julia Barton the Water Polo player. At the same time, all of the things I have gained from competing in elite sport have allowed me to persevere and I’ve been able to throw myself into my degree and my jobs. “I have two more years left of my physiotherapy degree, which includes a lot of clinical placement and some interesting subjects which I’m really looking forward to. “Water polo wise, I’m looking forward to playing the remainder of the 2019 National League season with the Hunter Hurricanes and hopefully perform well enough to be considered for representative selection. I would love to compete internationally again and play another World University Games.